Inside the box one gets a total of ninety two parts molded in light grey resin. Instructions come as a set of three individual pages and there are no decals. Even though the kit is packaged in a very sturdy cardboard box, I was dismayed to find that all the parts were left attached to their pour plugs which were then enclosed in plastic bags and placed directly into the box. This didn't afford much protection during its trip to my mailbox and as a result they rattled around inside the box so much that the majority of the small parts arrived shattered into small pieces. Most disappointing! Just a little bit of tape and some thin cardboard backing would have easily prevented the damage. 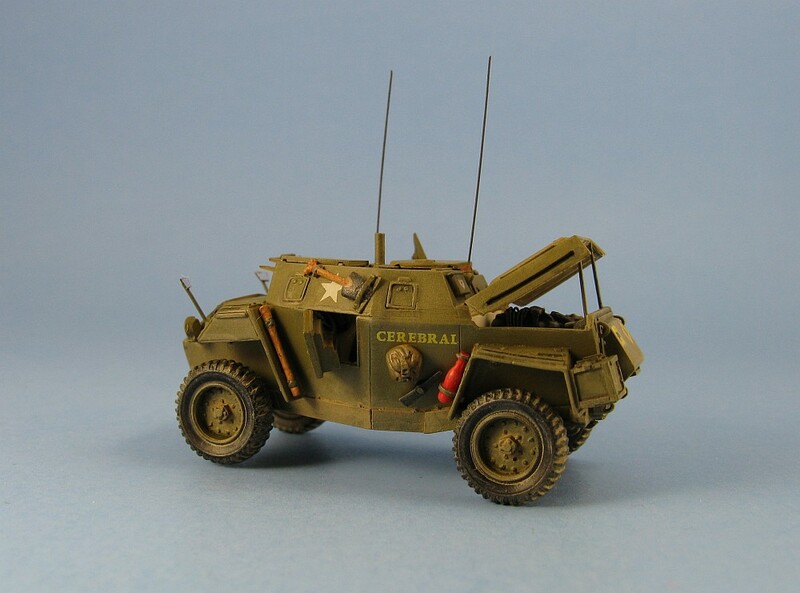 Skip using the roof mounted Bren gun and its associated mount. In its stead I used a short section of plastic rod with the center drilled out to represent the mount minus the gun. Skip using neither of what appeared to me to be suspension arms (I think these were parts 5 & 6, named lenkstange). Replace the two rear leaf springs. The springs were replaced with some plastic versions taken from the spares box and modified to fit. Make new fender mounted mirrors. The mirrors were fashioned from small pieces of silver sequin and the shafts were cut from some thin piano wire and glued to the back of the sequin pieces. Inspection of the pieces still on the pour blocks showed the interior parts and the rear axle to be a bit on the blobish side. 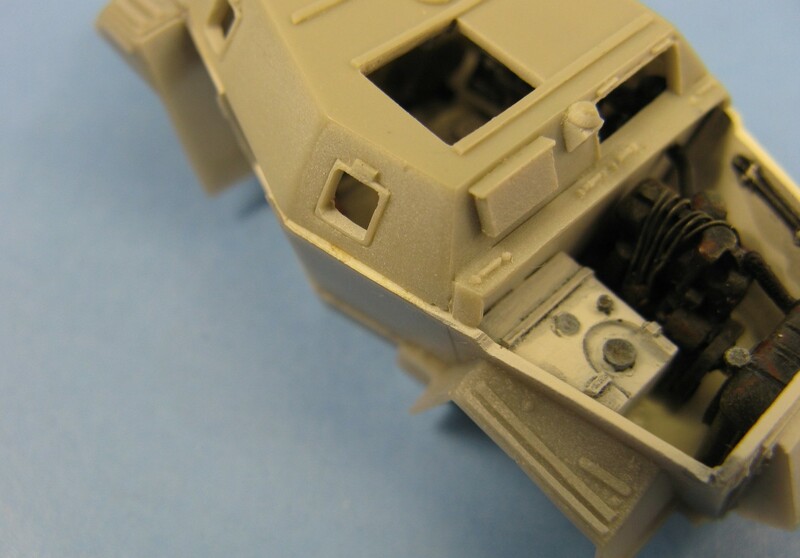 The flat surfaces on the hull interior and exterior all have a slightly rough texture and there is the odd small air bubble that needs to be filled. The front suspension parts were cast with next to no open space between the axles and the arms. There was one oddity. The MPK logo is cast directly onto the resin on the underside of the body just below the rear axle. Kind of reminded me of what the plastic manufacturers did circa 1960's and gave the kit a retro feel. You can either leave it there and live with it, or remove it, which requires a lot of scraping and sanding in a very enclosed place. I found the shovel and pick to be a bit chunky for my liking. The instructions are very poor. First of all they only come in German which is rather irksome. There is no step by step or even an exploded diagram to guide the modeller during the construction. 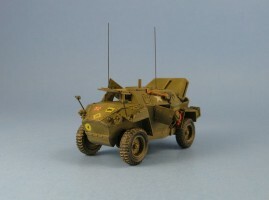 All that is provided is a set of photographs showing the kit built with the parts already in place on the model along with some lines to the part name. The kicker comes when you realize that the pictures only show the upper side of the model. 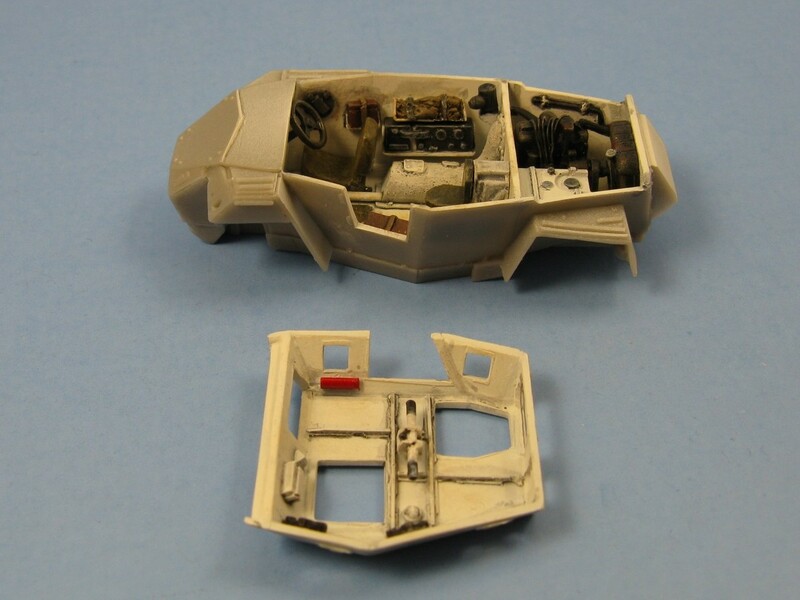 With no pictures showing the belly of the vehicle, it's left up to the modeller to try and figure out where the parts are supposed to go. True, there's not a lot of pieces for the suspension, but it sure would have been nice to see the layout of the undersides just to make sure you have parts located properly. Superglue doesn't give you any margin for error if you put something in the wrong place. 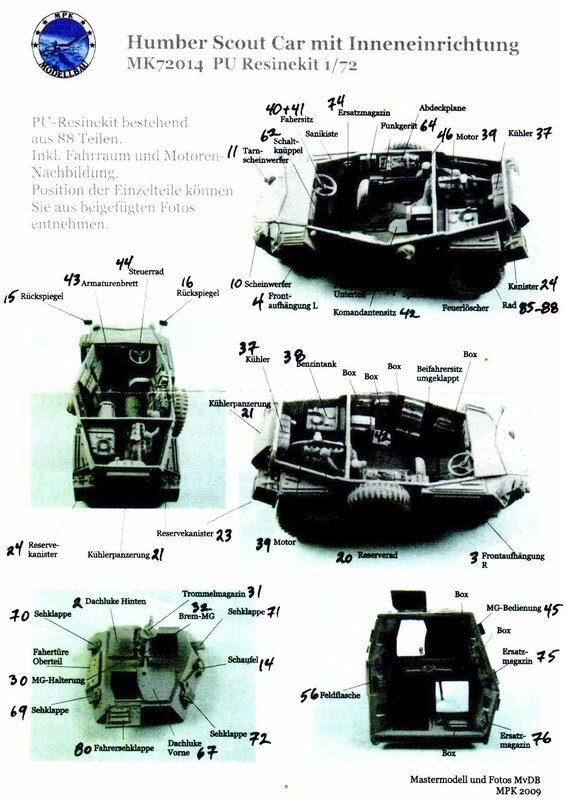 On top of that many of the parts are not even labeled on the pictures of the built model (for example, the battery box, part 57, and the seat that attaches to it, part 42). With this in mind I spent a few moments and manually labeled the missing parts on my instruction sheet (see scanned image below). 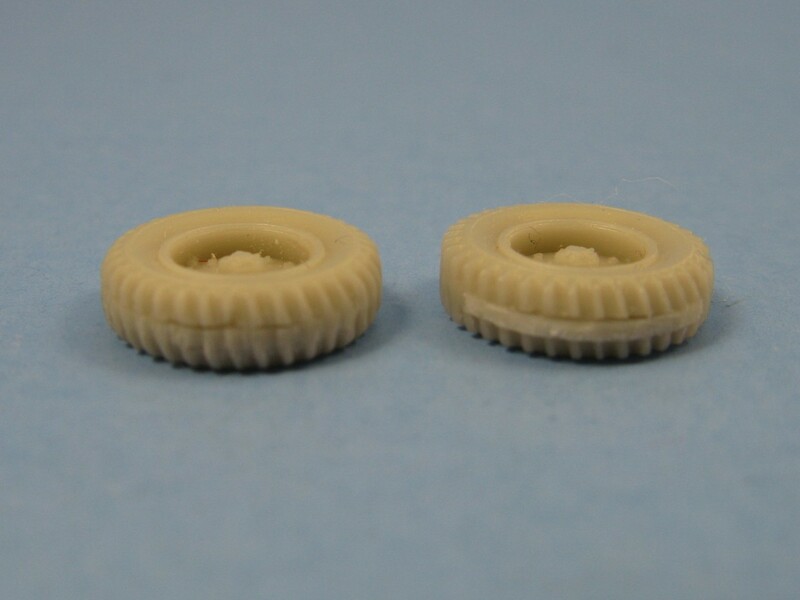 As is common with resin kits the parts are not numbered on the pour blocks. 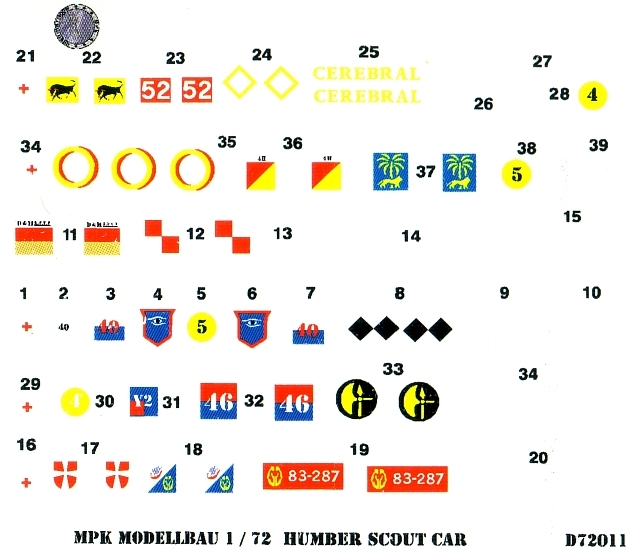 The instructions do have a photograph of the various parts with their associated numbers though. After some thought I decided that it would make the build move along much faster if I numbered all the parts directly on the resin blocks. So, using the pictures as a guide, I wrote the part number beneath each piece using a black indelible felt marker. This was a bit more work than anticipated. 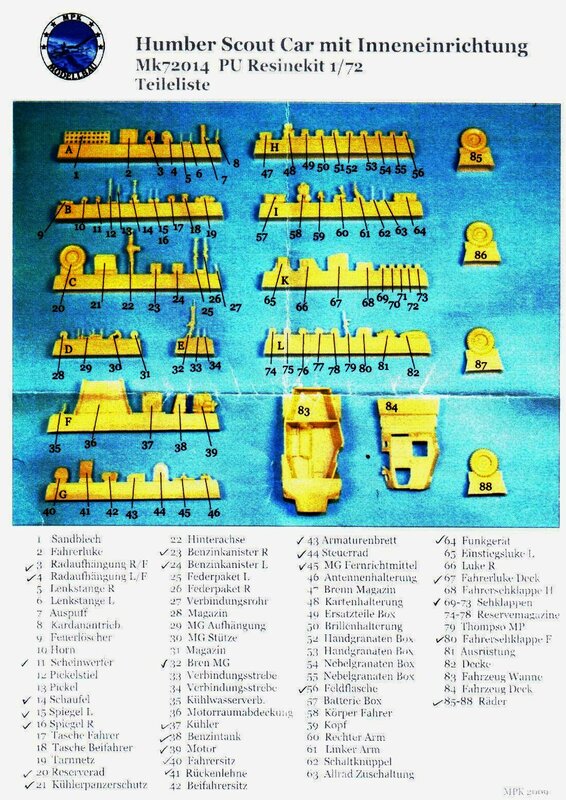 Even though the locations for the parts are indicated with lines on the instructions, no part numbers were used, only the German name for the part. So I also had to find the corresponding English translation (using Google's online service) and then jot down the part numbers on the diagrams after matching them to the parts diagram using the part name as the reference point. In a few cases the name on one sheet did not match the name on the other sheet, so some educated guesswork was needed. 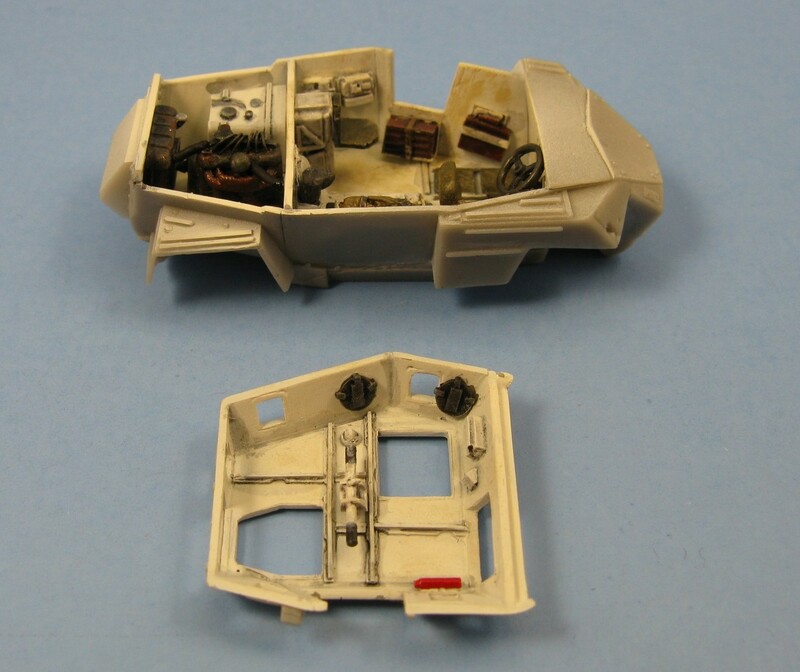 There is no painting guide for the interior or for the motor and engine bay. Once again it's left up to the modeller to search for this information on his own or make some educated guesses. 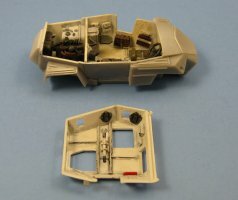 The best interior pictures I could find are at the War-wheels.net site. These helped somewhat but they did not provide complete photographic coverage of the interior so some guesswork was still needed. 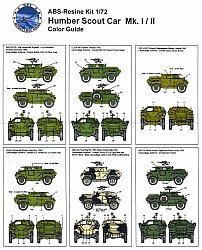 With the kit's instruction sadly falling short of information I got some additional help from build reviews of the Bronco 1/35 scale kit found on the web. 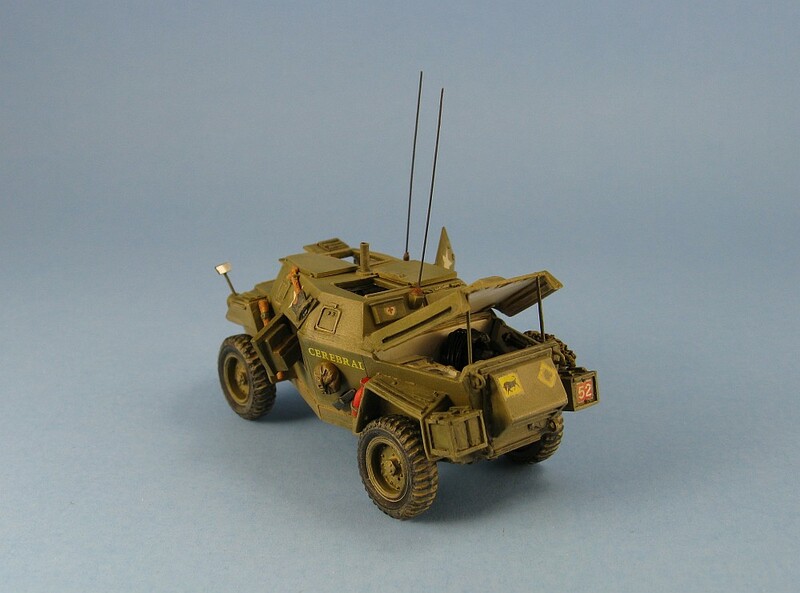 The kit provides the option of building the vehicle with the hatches, view ports, doors and the engine cover either open or closed. I felt that having too many open ports was a recipe for disaster and chose to close most of the really small ones. As with all resin kits the parts need to be carefully washed in warm soapy water or alcohol before any construction can start. 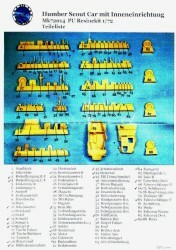 First to be built was the hull interior. This needs to be painted and weathered before adding any of the other pieces as you definitely can't go back and do it after the upper and lower hulls are together. I painted the majority of the small parts while still on their pour plugs and sprayed the inside of the hull pieces (parts 83 & 84) white. Weathering was with washes of black and Modelmaster 2103 Afrika Dunkelgrau, followed by some dry brushing with light grey to tone down the white. I didn't spend a lot of time on the weathering. Even with all the ports and doors open you still don't get much of a view of the interior. Once the interior is finished, the hull pieces are joined. 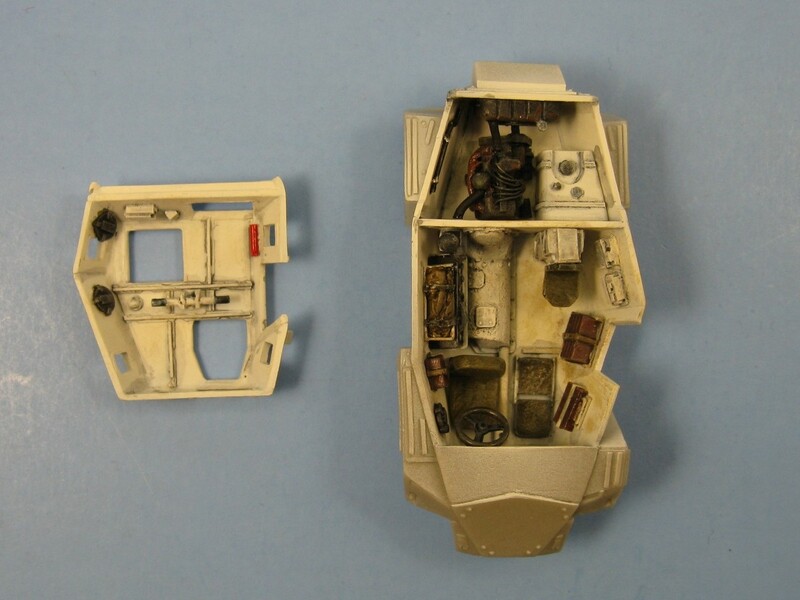 The upper hull is marginally smaller than the lower half resulting in a step that needs to be filled and sanded (see the above pictures for the step and to see one of the pin holes found in the rear antenna mount). Nine wheels and tires are included (8 for the axles even though only 4 are needed) and one to be mounted as the spare. Not sure why eight were in the box though I suspect this was done to give the builder the opportunity to use the best 4 of 8 wheels since most of them were cast with thin fissures at the point where the pour stub meets the tread. After choosing what I thought were the best set of four I still wound up with two wheels that needed filling. The fact that the engine cover doesn't fit extremely well over the engine bay helped me decide that this definitely had to be mounted open. It also gave the opportunity to view the engine, which is quite a nice item and I added plug wires made from very thin wire to it just for the fun of trying something different. Unfortunately the instructions were one again found lacking. Sure, MK72 give you the nice engine bay and the parts to go into it, but exactly how the cover is held open is not shown. So it's again up to the modeller to find this out. 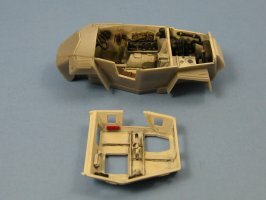 The pictures at war-wheels.net did not have anything showing exactly how the engine hood is supported, but if you look closely at the engine bay photographs you can just make out a portion of the support rods at the rear end of the bay. I have no idea how long these rods were so I once again I made an educated guess, cut a short length of thin piano wire and attached them with some super glue between the cover and the rear of the engine bay. A nice touch was the small indentations for the tow rings. These were deepened slightly using a drill bit and then wire was bent to shape and superglued into the holes. 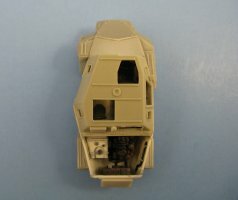 Painting was problematic - exactly how was I going to paint this sucker with the minimum of finger handling, and how was I to mask the openings to prevent overspray entering and damaging the white paint on the interior? My solution was as follows. 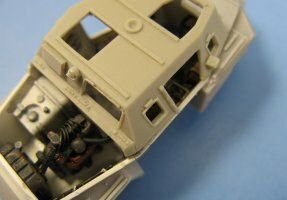 First, to avoid touching the model as it was painted, I found my strongest welder's tweezers and used it to hold the model by the rear axle. As for the masking, I first tried some of the more common masking items I've used before to stuff into the opening (tissue paper, masking tape, blue tack) but they all failed. My final solution was to use some Parafilm "M". The film was cut into small pieces, stretched, and then formed into small wedges that were carefully pushed into each opening. The wedge shape kept the film snug in the opening and the slight tackiness of the Parafilm kept it from falling out. Any small voids between the film and the edge of the opening that might allow paint through were easily closed up by slightly stretching the film with a toothpick so it would touch the edge. This worked quite well except I had one minor mishap. The point of each film wedge projects into the interior a bit and while pushing one of them into its place I accidentally snapped off one of the interior pieces. Unfortunately I wasn't able to remount it after the masking was removed because the spot where it was supposed to go was too confined and the ports and doors openings were too small to get any sort of tweezers through. Alas, after many attempts I had to give up trying and just accept the fact that the modelling gods would not allow me the satisfaction of fixing this. With no decals in the kit, once again it's up to the modeller to find suitable markings. I'm pretty sure that the only ones available for this beastie are from MK72 themselves with their set D72011. 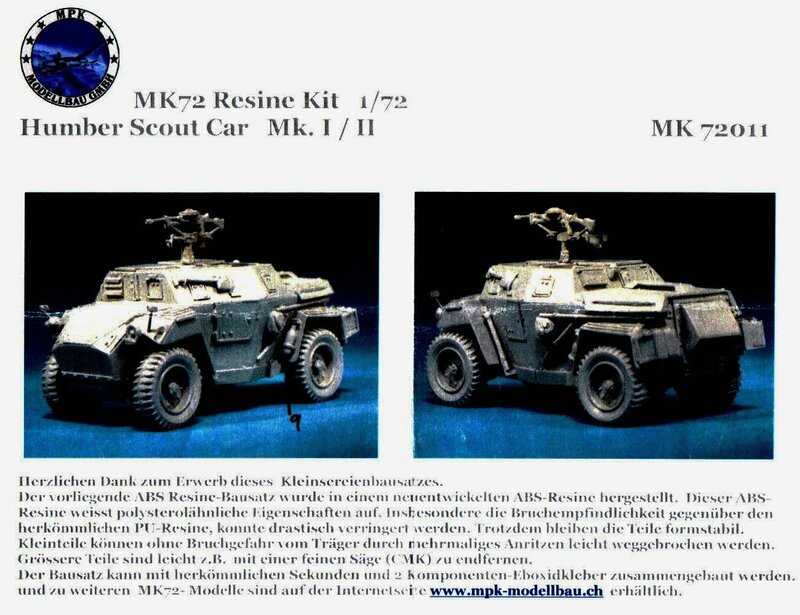 It's nice that they have them available but I feel that MK72 do a disservice to the modeller by not including them, or at least a subset, in the kit. So not only do you have to spring for the kit, but you also need to spring for the decals. A close examination with the old magnifying glass showed them to be slightly pixelated as is common with many ALPS style decal sets. With the naked eye the pixelation actually isn't very noticeable except on the gold/tan portion of the unit flash for option 3 above (decal number 11), where it is quite noticeable. 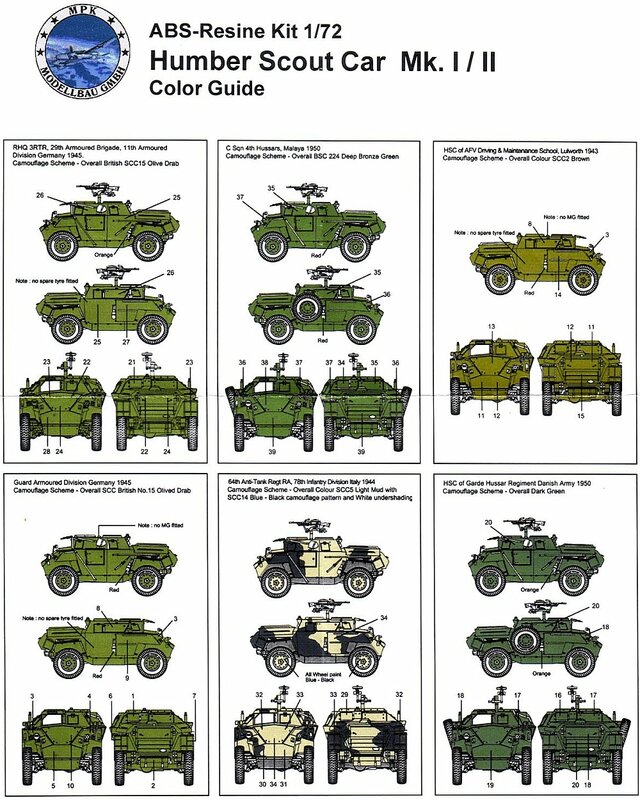 Ink density also appeared to be quite good but I had misgivings about how well the decals would handle bleed through of the dark green camouflage of some of the options. After some rumination, I chose option 1 as the decals showed no obvious pixelation. Based on previous experiences with other ALPS printed decals and their fragility while being handled, I first coated the images I wanted to use with Microscale Liquid Decal Film. The decal film is very thin and care is definitely necessary when applying them to prevent them folding over on themselves. I found the decals were a bit stubborn when is comes to sitting down snuggly even after many applications of Microsol setting solution. Almost all of them unfortunately silvered. It may be best to apply these on top of a small puddle of Future Floor Polish (marketed as Kleer in Europe if I'm not mistaken) and let the drying of the polish pull the images down snug and also give a nice glossy undercoat to help prevent silvering. I found the white stars allowed the dark camouflage to bleed through, thus darkening them a bit. Normally when I'm in doubt regarding the opacity of white decals I'll replace them with ones I know will not bleed, but I figured I'd give these a try just to see how well they would work. Now, don't get me wrong. Outside of the atrocious instructions, and the inexcusable lack of decals, the molding of this kit is one of the better examples of what can be produced in polyurethane resin. But in my mind, as nice as this kit is, this subject would have been much better served as an injected plastic kit. 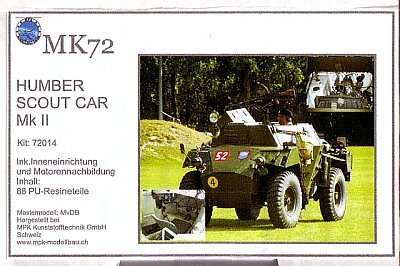 Maybe MK72 will explore this option now that they appear to be branching out into this media. I'm sure this would be a very popular subject in injected polystyrene plastic. As for the decals, they are somewhat disappointing due to their pixelation and density issues. Any silvering was of my own doing. Review sample provided by Peter Kuonen of MPK.